Buenos Aires is famous for its electric nightlife, but exploring a new city after dark can be intimidating. This private 4-hour tour offers a safe and fun way to experience Buenos Aires by night, including a delicious dinner at a local ‘parilla’ (grillhouse), an atmospheric tour of the illuminated city, and a nightcap at a San Telmo bar. After being picked up from your central Buenos Aires hotel by private vehicle, kick off your evening with a dinner date at a popular ‘parilla’ restaurant in Palermo. The traditional grillhouse is an excellent spot to sample Argentina’s world-famous steaks, cooked over a wood-fired grill, and you’ll be treated to an all-inclusive a la carte dinner of delicious meats, salads, dessert, and wine. With your appetite sated, set out on a guided sightseeing tour of Buenos Aires by night, and admire the dazzling neon lights and spectacular illuminations. Drive down the grand Avenida Libertador and through the idyllic Bosques de Palermo (Palermo Woods) to reach the central thoroughfare of Avenida 9 de Julio. Hear how the grand boulevard is the world’s widest avenue as you spot landmarks such as the statue of Don Quixote, the Teatro Colon, and the palatial French Embassy building. Soak up the buzzing atmosphere along Corrientes Avenue, and see the looming Obelisco (Obelisk), one of Buenos Aires’ most memorable monuments, which is dramatically lit-up in the evening hours. Jump out in nearby Plaza de Mayo, and enjoy around 30 minutes of free time to marvel at the illuminated monuments, whizzing traffic, and colorful crowds of revelers. Continue along Avenida de Mayo, passing Plaza Congreso and Palacio Barolo, once the tallest building in all of South America, before turning down the cobbled lanes of historic San Telmo. The city’s oldest neighborhood springs to life in the evening, with locals flocking to its bars, cafés, and tango bars, and the party often spills over into the streets, where artists and dancers perform beneath the streetlamps. 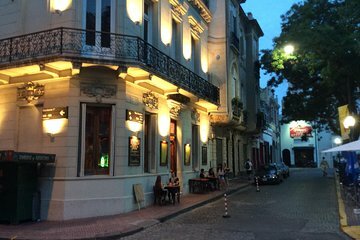 Follow your guide to Plaza Dorrego, at the heart of the district, and stop at one of the lively bars for a nightcap (included) as you soak up the atmosphere. After a thrilling tour of the city by night, your evening ends with drop-off back at your hotel.